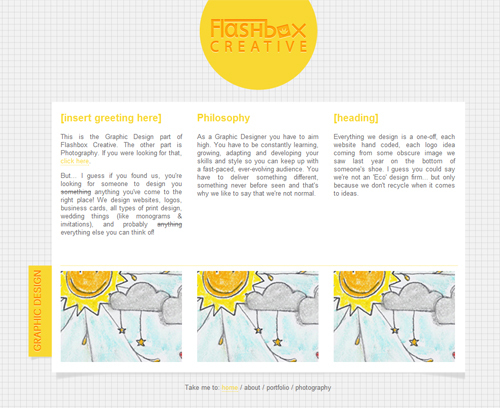 Well, today I started to redesign the graphic design section of Flashbox Creative. Our website has changed a few times and I'm still not happy with it. I guess that's the downside of being a graphic designer? Or maybe that's a good thing because you don't stop learning, developing and getting better. I read a quote on pinterest that said you have to stop competing with others, and compete with yourself.. I like that. For me that means you can never be satisfied with your level of skill, you got to keep getting better and better. This is just the basics of where I want to go with my website and the photography side has a similar layout but a bit more formal. It's not up yet but all coded and ready to go, just have to get the photos in there. Whenever I do a web project I always remember how much I love coding and web design. I just wish I had more opportunities to do it and get creative with it. I should just design & code self initiated things, but I'm a little lazy I guess. Mr Peck always tells me that I should be more of a designer and actually act like I love it. Which is true. And I am ashamed of myself for not being more of a designer. So, here's hoping I can start living it again!